Even the RatHaus's rat house is getting a little seasonal decoration this Christmas. Here, in this reeeeaaally dark picture, Yates models a brand new hammock made for the boys by Carolyn. Doesn't he look awesome against the John Deer ticking cloth? 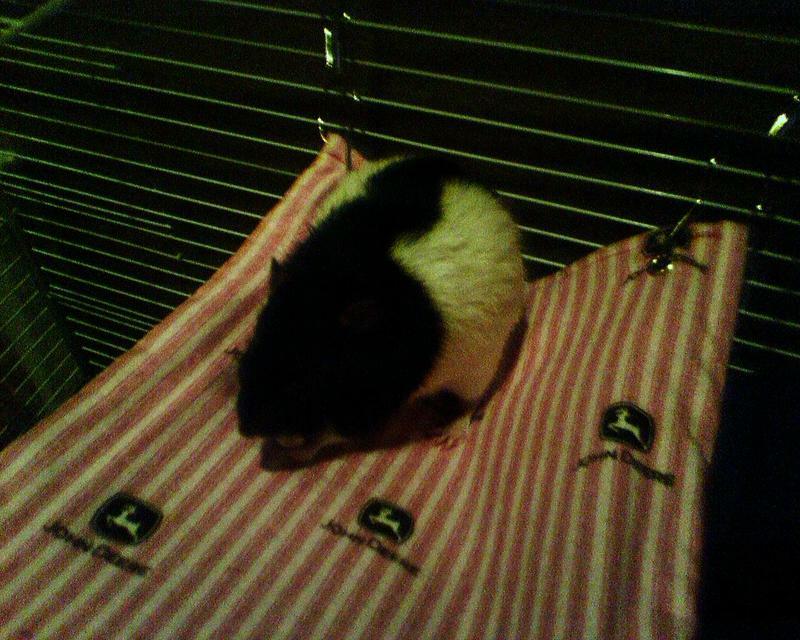 She also made them a supercool rat toob, which is about a foot and a half of cuddly polarfleece. The boys have already demonstrated that this length is perfect for containing three rats comfortably. Yay for Christmas! 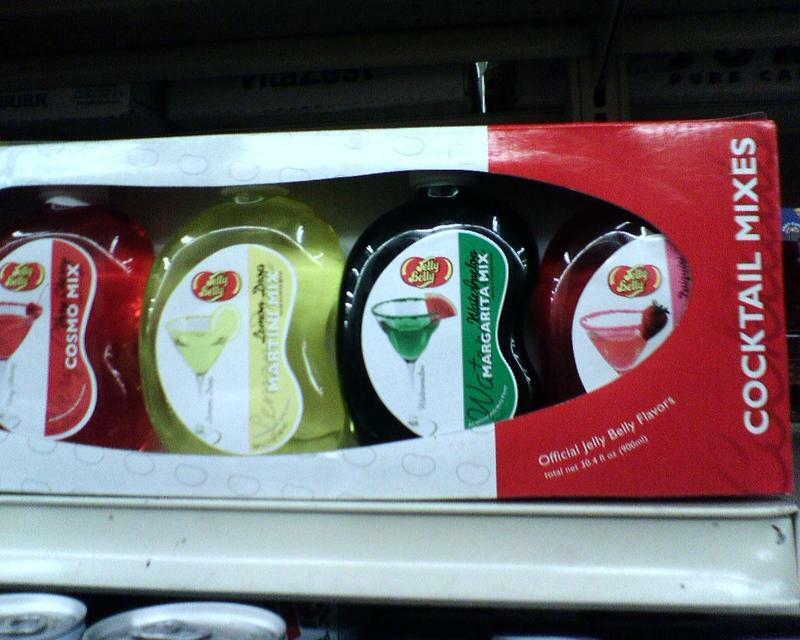 Does anyone else see something slightly askew with cocktail mixes in 'official Jelly Belly flavors'? Fry's is such an icon of silicon valley, I've actually had to drive people to one in years gone by as part of the Bay Area tour. But I associate it with three things: one, that they are going to be the place to have the ridiculously obscure hardware tidbit we need; two, that I'm not going to enjoy shopping there because I'm going to have a confrontation with the door nazis for trying to assume I've stolen my legally purchased swag; and three, that I'd better know exactly what it is I need and where to get it because not a single employee on the Fry's W-2 list has the slightest clue about anything related to computers. Seriously, it's like in the employee manual or something. They'll fire you for knowing. I walk toward computers, knowing networking and computers are two distinct departments with no association to one another in the minds of the evuhl Fry overlords, but valiantly hoping the computer people might at least have some clue as to what I'm after. I flag down clerk number two leaning against the laptop display, who is obviously hoping the middle aged lady is here to buy a new computer set-up so her six year old can play Doom. He then proceeds to lead me to peripheral cables a few rows from computers, stuff with ohmigod shielding and price tags. Stuff that looks nothing like coils of patch cable. He hands one of them to me. It has a 21pin connector on the end of it. I find aisle 35 in a dusty dog leg of the store past the registers, overflowing with pack upon pack of cable. They're probably so well stocked because no one can find the stupid stuff. Yeesh. Next time I'm just going to start with an angry shakedown of the first Fry's employee I see. It seems like the only option. Lynn got her fixator off Thursday, at least for now. She may or may not need a different kind, depending on the xrays next week. Let's hope not. That is all. We now return you to SOP life, already in progress.